Self-Empowering Saturday For College-Bound High School Students, Graduates and Their Parents | Bellmore, NY Patch. Congratulations to Devon Harris, motivational speaker, author and founder of the Keep On Pushing Foundation, on being honored for his community service by New York’s Nassau County Executive Edward Mangano at the Caribbean American Festival on Saturday, June 15, 2013. 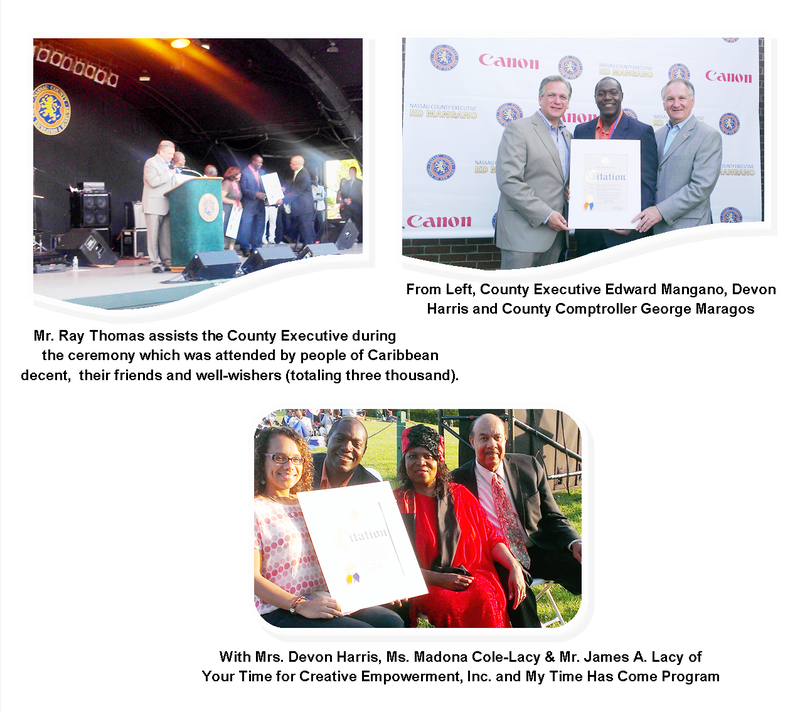 Mr. Harris, also of Jamaican Bobsled fame, has for the past two years been an avid supporter of Long Island’s non-profit, Your Time For Creative Empowerment, Inc. and the My Time Has Come Program. These long island based programs have been served well by Mr. Harris’ captivating and spirited motivational presentations to parents and youth. Mr. Lennox O. Price – Consul General of Barbados to New York. We congratulate all of these honorees for the exemplary work they are doing in their respective fields and communities. 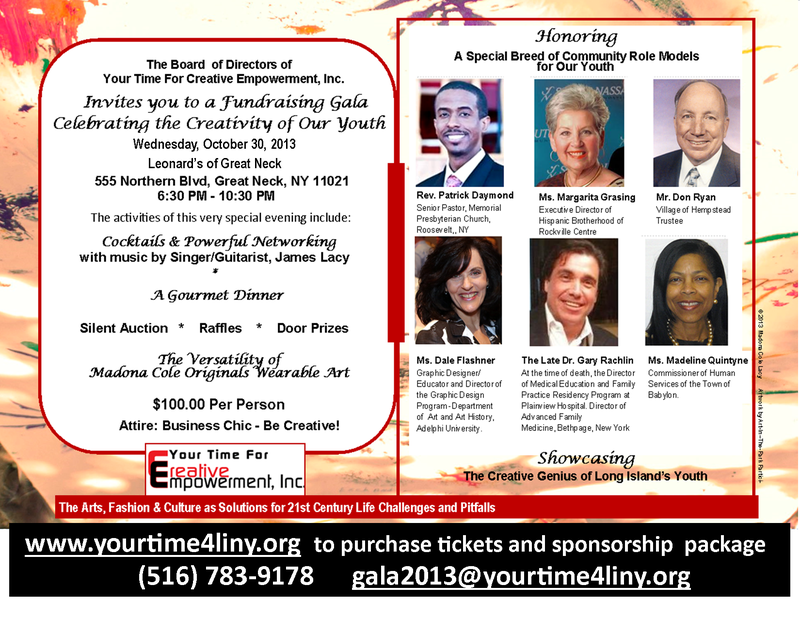 Your Time For Creative Empowerment, Inc. engages in activities designed to empower youth & families by providing tools for handling the challenges and pitfalls of life in the 21st Century through the use of the arts, fashion and culture alongside creative personal development and behavioral modalities. My Time Has Come Program is an art-related cultural and social enrichment enterprise which offers workshops to teachers, students and community organizations. My Time Has Come Program promotes tolerance to racial, cultural, ethnic and generational differences; fosters a sense of belonging, accomplishment and pride gained from the creation of well executed culturally inspired works of art; and develops skills in the use of hand-crafted textile designs and contemporary, multi-cultural visual arts techniques. Author: Madona Cole-Lacy, MA Ed. Founder: Your Time For Creative Empowerment, Inc. 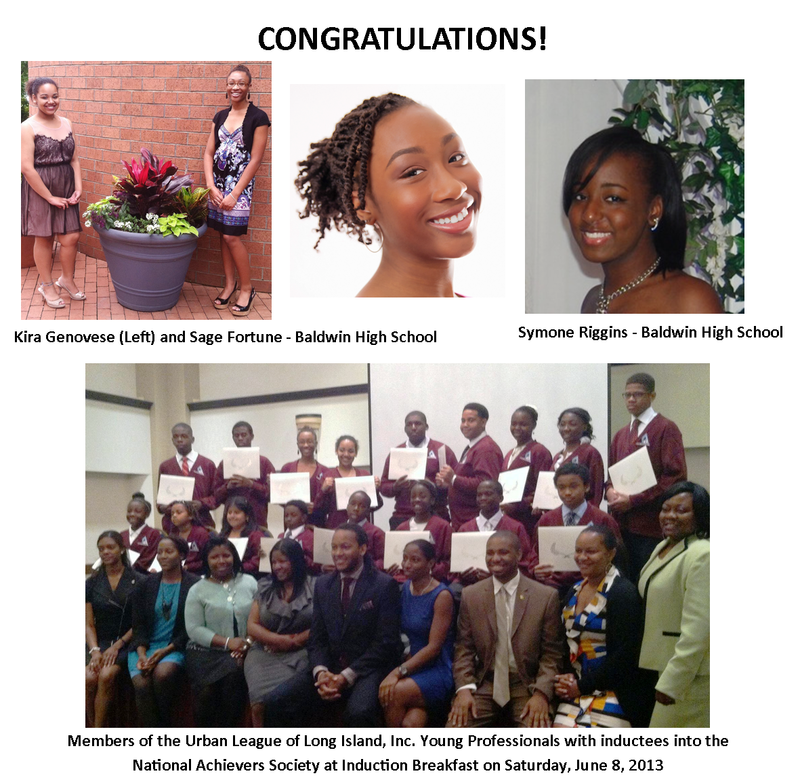 Some of the Brightest and Best students from a total of 15 long Island area schools, were inducted into the National Achievers Society at the Huntington Hilton on Saturday, June 8, 2013. Thanks to the Urban League of Long Island Young Professionals for spearheading this annual event and giving Long Islanders the opportunity to sponsor hard-working students from grades 3 through 12 for induction into the National Achievers Society. Congratulations to all inductees, their parent, guardians and teachers! With so many unsung achievers in communities throughout the country, it is incumbent on local and national organizations, as well as individuals, to take full advantage of this and similar opportunities to formally acknowledge and celebrate the achievement of our youth by sponsoring them for induction. A special acknowledgement goes to the following inductees who participated in the 3rd Annual Self-Empowering Workshop for College Bound 9-12th Grade Students and their Parents, hosted by Your Time For Creative Empowerment, Inc. in April 2013. Our free self-empowering workshop series for high school students and their parents went without a hitch due to the collaborative spirit and work behind the scenes of some, in an attempt to get others to experience the excitement of our brand of college survival and high school success prep. We thank our sponsors, volunteers and Resource Persons for believing in us. It was the recruitment process that turned out to be the ultimate eye-opener with lots of extra mural education for the fabric of our lives. Caring people helped us reach out to the audience for whom our carefully packaged gifts had been prepared. Please read on for snippets on the nature of the support we received. When transportation became an issue, and our efforts to court a local bus company failed, plans were put in place to solve that problem. We want to thank a selfless and good-natured public official who spearheaded such a move. Some placed our flyer on their websites while others worked at forwarding our emails to people on their contact list. We are grateful for the invitation to an advisory board meeting and a school college fair. Announcements were made in churches and one pastor made attempts at a collaborative effort by referring us to his youth ministry, a clear indication that he practices what he preaches. We celebrate his supportive spirit and pray that his congregants will forever be “infected” by his spirit of collaboration and kindness. Our flyers were welcomed at libraries, and information shared on websites including one art organization’s website whose director was interested enough to oblige valuable pointers. We witnessed leadership at play, when a school superintendent made time to meet with us for a meaningful conversation. What a blessing this leader is to his administrative staff and students! We are grateful for the graciousness and benevolence of Molly College, for providing workshop space for three years in a row. When it became necessary to do a second day of programming, an ‘angel volunteer’ picked up the tab – leaving us speechless. Some sponsors provided nourishment and quenched the thirst of our participants. One provided breakfast and lunch two years in a row, in addition to snacks and space for our meetings. The other provided lunch on two occasions. Our beverage needs were taken care of by another sponsor for the past two years. What would our goodie bags have looked like without the variety of meaningful items donated by four of our sponsors? A discounted shopping event accompanied by coupons from a sponsor of three years is in the mix. Some took journal ads and made financial contributions. The media outlets made public service announcements. Promotional materials would have been prohibitive at full cost, without the benevolence of our promotional materials sponsor. A truly enlightening and empowering experience as we shared the joys of those who were able to deliver, and the disappointments of others who tried to deliver, but were unsuccessful in doing so this time! Please share with us the praises of the connective dots of kind-heartedness in your life.